There's plenty of fresh content coming to Splatoon, and one cheeky fan has "data-mined" the disc to find out exactly what it is. They've uncovered new stages, weapons and info - all of which counts as a leak, so if you'd rather find out through official channels, turn off your screen now and go outside for a walk or something. Are they gone? Right, let's proceed. According to the data-mining, there are 10 maps on the disc - two of which remain unreleased. One is Camp Triggerfish (which we already knew about) and the other is a skyscraper-style stage. 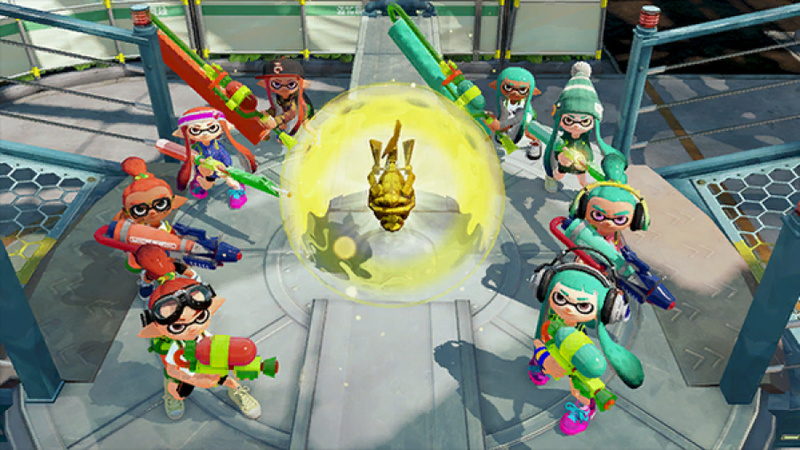 In Rainmaker, both teams compete to snag the Rainmaker. Once you've got it, the goal is to carry it into the other team's base! So as soon as the battle begins, grab that Rainmaker! It's guarded by a shield, though, so you'll need to bust it out first. Once you snag it, head for the other team's base. And be quick about it! If you run out of time or get splatted, the Rainmaker will be dropped. Its shield will also reactivate. The Rainmaker is crazy heavy, so you can't Super Jump while carrying it. Your teammates will have to watch your back! The Rainmaker can also shoot ink like an Inkzooka, so you can clear a path! The closer you get to the enemy base while holding the Rainmaker, the lower your goal distance will drop. If the battle ends without anyone carrying the Rainmaker to the goal, the team with the lowest goal distance will win! Nintendo has been pretty quick at getting new weapons and maps live, so expect this content to roll out over the next few weeks. ...nothing is scared anymore. But at least we know there are many weeks of free content still to unlock. Good stuff, kind of hooked to splatoon atm. Is it really a leak when it's stuff that's on the disc of every Splatoon owner already? New mode would be very welcome. all of that in one DISC!? I don't like how all these content releases are nothing more than unlocking completed disc content. At least in August we'll have a true complete game for no extra cost. It's a online game! Of course they release more content in future patches. I think it's rather odd they make us buy all these different weapons. A better solution would been that you buy a weapon, then pay a fee to change the sub and special. You should also be able to customize the appearance of the weapon yourself. Not a fan of this fixed system. All those weapon choices and I only ever use one,Aerospray RG.I should really get out my comfort zone with it and try changing how I play the game but everything else just seems inferior to that bad boy.I like to leave inkmines in narrow passageways and take great satisfaction tempting a foe to follow me round the corner only to step on my mine and you cant top unleashing an inkstrike near the enemy base and charging in John Rambo style and picking them off like flies with the trusty Aerospray RG.One time I managed to take all 4 opponents out myself within second with the inkstrike and charge method.I've been unsuccessfully trying to recreate that destructive move ever since. What about us with a digital copy? Joking aside, I was referring to the general hate against patching games that I see a lot lately. Online games that doesn't unlock/patches content will stagnate over time, so it's not a bad thing. @PaperMario64 It doesn't make any difference,the content is already there be it digitally or on disk.It will be unlocked to us whenever Nintendo decides to unlock it,no need to update.The big update in August will require an update though. @OorWullie u can just run over those mines if u have 1 running speed up in ur gear. @Miko08 Ah that explains a lot.I did wonder why some opponents were'nt taken out by it.It does still seem to do some damage though as I can usually finish them off before they get me. I hope there'll be more offline content...to play with friends in the same room. I just worry whatll happen in a year when there aren't as many still playing it? Well at least things will be kept fresh and the stuff on disc that's yet to be released looks fun. Yes, dammit! More stuff! The sheer length of that weapon list already has me excited! And Rainmaker sounds pretty interesting, as well! Splatoon was secretly developed by EA. Carbon Roller Deco - Carbon indicates it'll be a faster roller than standard, but gotta be slower than inkbrush (i.e. it's made of carbon fibre and therefore lighter?) and... my god... Seekers combined with bomb rush? On a roller no less? That thing could be DEADLY in splatzones. Two things this game desperately needs IMO: More battle modes and FIX THE SERVERS. I get dropped from matches pretty often. Check your own connection Nintendo ! CAPTURE THE FLAG! Yay. I can die a happy squid. This is nothing more then Nintendo trying to give us something to play all summer long. Without any other notable releases till September here in NA I'm thoroughly convinced this was always the plan from the beginning to time release this stuff to flush out the fact nothing else is coming. This isn't a genious move on their part or is it they want us to have everything from day one. Simply a game they could use to hold us over, I'm ok with that! Rainmaker is going to be awesome (and intense). Splatoon is easily my favorite wii u game. I like how Nintendo is slowly releasing the maps and weapons, it keeps the game interesting and allows you to learn the ins and outs of the weapons and maps. @Ps4all Right, people talk about making it last all Summer and they just want it all now, but this strategy seems great for the actual experience of playing as well. You can get accustomed to each new thing along with the community at the same time. It's much more satisfying that way and gives you a chance to learn strategies first. It also brings up the community together in skills rather than a huge discrepancy at the start. Obviously, I don't really know what's going on there, but as far as what I've been experiencing with Splatoon, it has been amazingly smooth. I think I had one connect issue that dropped me right when we were about to find out the results in a Ranked Battle. I saw a little bit of latency on ink covering on one occasion, and I think I might have seen it one other time. That's it. So does this mean that a large portion of on disc content is incomplete and is still being worked on. It looks that way, since not all the maps are present and almost half of the weapons were said to be incomplete. @JMR_Alden There probably are more, they're just not on disk. After all it stands to reason that there would be some off-disk content considering that half of the leaked weapons are incomplete and the Direct did show 14 maps. I hope all those weapons mean more levels. A cap at level 20 isn't nearly enough now that so many people are there. 50 would make a lot more sense. I know we are supposed to go into ranked after 10 but if we want to play w/ our friends we needed to be in turf war. I bet some of those 20 players would be 50 by now, some just made it. I'm at 19 1/2. And while level may not matter to some, it's still a thing, so make it a thing that matters. DragonballXenoverse has raised it's level cap 3 times over the past few months. Different genre I know, just saying games sometimes raise level caps, it's not unheard of. I'm pretty sure WoW has done it as well. Rainmaker sounds like it was made w/ that skyscraper level in mind. Better be like a 10 minute time limit to have nay chance to finish. The last 4 weapons though: Gatling/minigun style weapon? I think once they unlock all the ingame content there is going to be a lot of actually DLC too. Sounds good! splatoon has been intense fun for me, especially ranked battle. 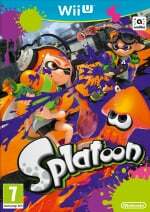 Just in case you want to have a look for yourselves, I did some poking around and found squid kid also uploaded the game's file directory. So the Rainmaker is... bad?